Where do readers find books? With the hibernation of the American brick and mortar bookstore, it can be hard to discover new authors and their new releases. I mean, you can’t just wander into Waldenbooks or Borders (or in some cases a convenient Barnes and Noble) anymore. And the selections at Target and Wal-Mart are great but they don’t usually cover all genres. You’d be hard pressed to find the latest science fiction series at Target, for example. And if you wanted the first 6 books in a series? Yeah, no. So you turn to the internet booksellers. And while Amazon might have every book ever written, that’s a little…. Overwhelming. And it may not solve your original problem. So how do I find the perfect book to read? 1. Follow me! On both this blog and my podcast, WOMEN WITH BOOKS, I’m always giving recommendations and if I see those books on sale, I try to post them on my facebook page. 2. Goodreads - Probably the largest social media/ website that’s centered around books, it can still be tough to find exactly the book you want to read. There are lists, there are contests, there are groups and you can browse all of them. Anyone can post ‘the top 200 books about cats in Quebec” and that’s awesome to have that space but it can be hard for a reader who’s specifically looking for something. My best advice? Follow the authors you already love. Start friending them and others who like the same books you do. You’ll see what other people are reading and loving. For instance, if you friend me on Goodreads, you’ll be able to easily see what I’ve read for my GR reading challenge this year. Then sign up for the Goodreads newsletters for your preferred genre. They can still be incomplete, but you will start to see what’s coming out and what looks good and what’s on sale. Also -Amazon now owns Goodreads. So you never know what cool functionality (or sales updates) you’ll see between the two sites in the future. 3. Bookbub - this is primarily still an e-mail newsletter that will notify you of sales on books in the genres that you select. But in the past year or so, Bookbub has added several new features that I really enjoy. You can follow your favorite authors and when they have a new release, Bookbub will e-mail you. Also, Bookbub will notify you if your favorite authors recommend books, and what they are. Interested? Sign up and try following me to see what happens to your TBR pile. 4. Amazon - the behemoth of online booksellers also offers some of the same features as Bookbub. For instance, you can follow authors (my profile here) and Amazon says you’ll get a notification of their new book releases. When THE ROYAL RUNAWAY went up on pre-order, a reader let me know that she learned about it from an Amazon e-mail - which is AWESOME. But I’ve heard other authors say that they’re not sure their readers are notified regularly. So if there’s an author that you absolutely can’t miss, best practice is probably to follow them at Goodreads, Bookbub and Amazon - a belt and suspenders approach, if you will. The other recommendation I have at Amazon would be to sign up for their Kindle Daily Deals e-mail. These sales can often be exclusive to Amazon, which means that Bookbub might not feature them. You have to act fast though - when Amazon puts books on sale, it might be a quick flash and then the deal is gone. 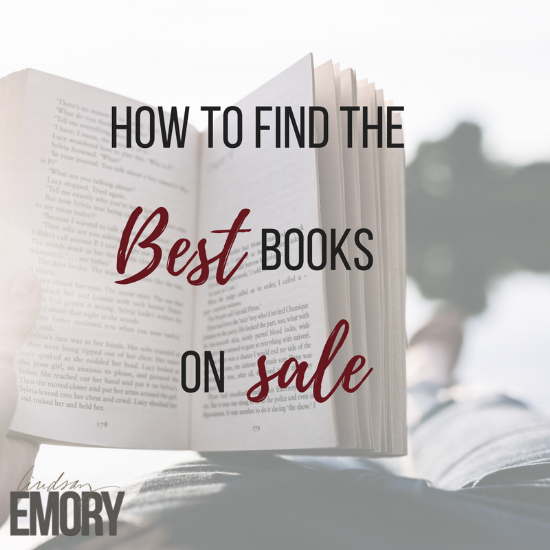 So those are my best recommendations for finding awesome new books (on sale!) to read. I know it might sound like you have to sign up for everything, but I promise you, authors and booksellers are so excited to put the perfect book into a reader’s hands. I know nothing makes me happier. You know what else makes me happy? When readers like you pre-order my latest book! Or add it to their Goodreads shelf! Or put it on their Amazon wishlist! All of these things help signal to my publisher and retailers that this is a book that people will love. And it is. Don’t you trust my judgment yet?